The last Saturday in the month of November brought the 9th Crepe City event to the Old Truman Brewery in Brick Lane, London… and it was to be the BIGGEST yet! Crepe City itself has been growing in popularity and quality, quickly becoming the biggest and best sneaker event in the UK. Following the success of CC8, it was going to be a hard task to beat but with VIP tickets selling out in under 10 minutes, along with 1000’s of tickets available to purchase on the door, and mixed in with weeks of chatter on social media about the event, it promised to be huge… it certainly lived up to those expectations. Being from Aberdeen, which is a 12 hour train journey from London, it was only my second event but once again, the Crepe City team nailed it and the event was a huge success. As always and as expected, the queues were big with some people showing up before 7am, so thanks to everyone who waited patiently to get in! With the two rooms filling up quickly with 50+ vendors, and the new addition of the third room which housed Gerard’s World Exclusive Jordan Exhibition, the event was starting to take shape, all we needed now was to start letting the eagerly awaiting crowds in! Much like CC8, the atmosphere inside the venue was electric with everyone trying their hardest to get first pickings on what was for sale, whether it be sneakers, clothing, accessories or artwork….. Or a burger supplied by Wishbone Brixton, and washed down with some Wray & Nephew Overproofed Rum if you were thinking with your stomach! This time around, the Crepe City team had worked hard to introduce some sellers from across the pond to add more variety and pairs that you wouldn’t normally see for sale in the UK… such as Colette GLIIIs, Bread and Butter GTIIs, and many more runners! On top of that, all the regular sellers were there with a huge range of kicks to cater for the whole family, men, women and children alike. 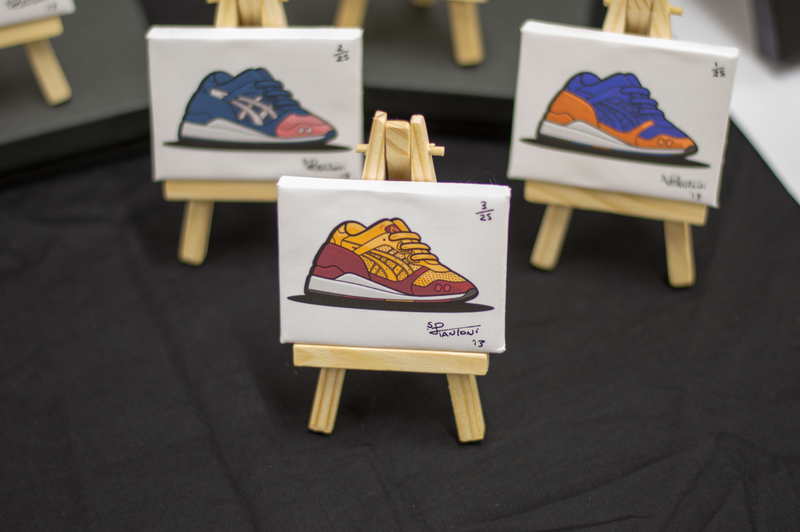 Throughout the year, there’s been various styles of ‘sneaker art’ developing and becoming much more popular, whether it be a large wall hanging painting or these mini Sneaker Toons made by Steve Piantoni, there was plenty to look at and take home to hang on your living room wall. It wasn’t just on the seller’s tables that there was a massive amount of heat, the CC events bring out the pairs on-foot also, and I uploaded a separate post with some on-foot shots, however, a couple of my favourite pairs spotted coincidentally have strong ties to the London ‘sneaker scene’. Crepe City 9 was to house a World Exclusive Jordan Exhibition which featured some unseen pairs and always pairs worn my Michael Jordan himself! Whether you were a basketball lover or not, it was well worth paying a visit to and getting a 5 minute history lesson from Gerard himself, the man behind the amazing collection. 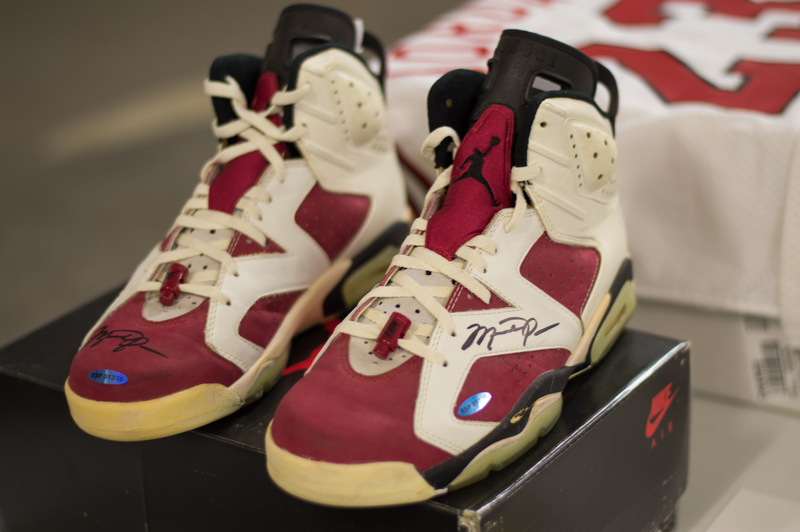 The pick of the bunch for me being these game-worn signed Carmine 6’s. Check out the Crepe City Instagram page for a little Jordan history lesson on the pairs featured. 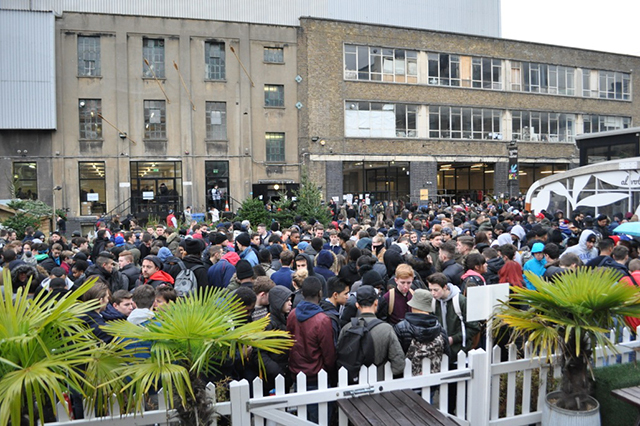 For me personally, it’s not all about the buying and selling, there’s a huge amount of work put in by the team for every event to not only pull it all together, but to bring the sneaker community to Truman Brewery for that one day. Putting the trainers on hold, meeting old and new faces, sharing a drink, and catching up is what makes going to the event worthwhile, it’s a true testament to the growth of the UK scene…. ….. see you all in Spring 2014 for the tenth event!